Preparation - USAg Recycling, Inc.
To be acceptable for recycling, plastic crop production containers must be empty, rinsed, uncapped, and dry. EMPTY: Plastic containers must be empty to be recycled. 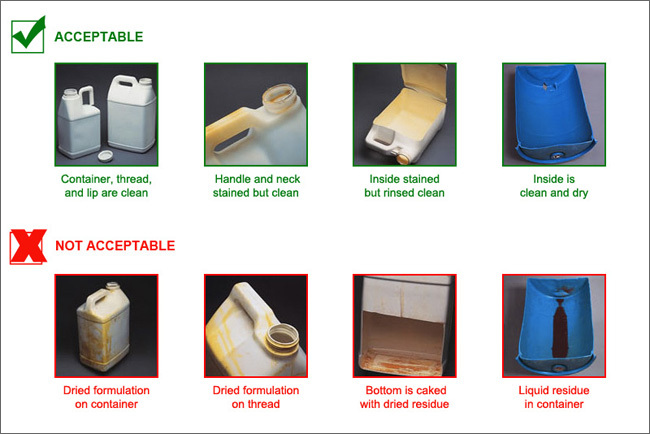 RINSE: Containers must be empty and triple-rinsed or pressure-rinsed to remove all residue. Staining is acceptable. Caked-on residue is not. Be sure there is no residue that can be smeared or will flake off when touched with a glove. The interior surfaces of containers must be dry. DISCARD CAP: Caps are usually made of a different kind of plastic and cannot be recycled. Be sure to clean the cap at the time the container is rinsed. Never put a cap back on a cleaned container. Dispose of the cleaned caps as normal solid waste. REMOVE LABELS: Labels and booklets interfere with the recycling process and should be removed. STORAGE: Cleaned containers must be kept out of the rain and away from the rain water. Store cleaned containers in a roofed building, an enclosed trailer, or in plastic bags.